Need a check up? Find recommended Battambang doctors, hospitals, clinics, opticians, pharmacies, and dental care. In general, most expats agree that it’s better to leave Battambang for anything other than minor medical care, whether it’s to one of the Thai-affiliated hospitals in Phnom Penh and Siem Reap for a higher standard of care, or abroad for more serious complaints. Doctors and clinics in Battambang generally only treat minor health concerns and refer anything more serious to a hospital. Read our in-depth report about medical care in Cambodia. Below you’ll find our recommended Battambang medical care providers. Need to get checked out? Battambang has quite a few health care options. World Mate Emergency Hospital was originally designed as a trauma hospital for conflict and landmine victims, but now is open to all and offers outpatient services from the Handa Clinic. Handa is a private clinic so treatment is not free but the costs are reasonable, and it is a good choice for basic check up for any minor concerns. 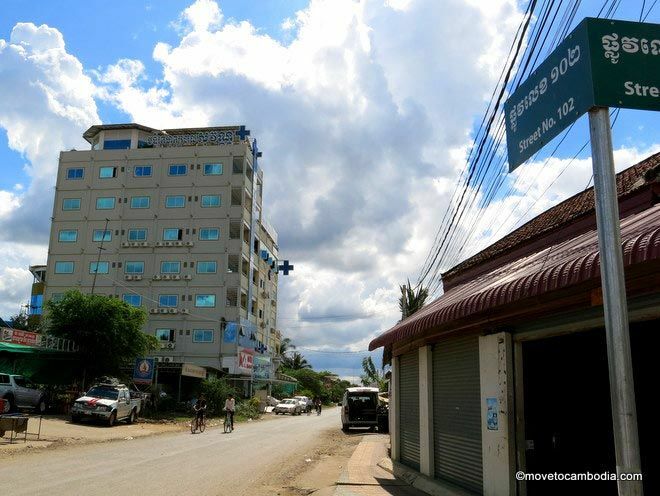 The emergency hospital attached is recommended for serious cases, and offers high quality –by Battambang standards — care. World Mate has a few Western doctors; expats give Dr. Simon Stock great reviews. If you’re feeling generous, they are also always looking for blood donations. Located in the middle of town, the Sovann Clinic comes highly recommended for quality care and diagnosis. They also offer a number of specialized services which can be referenced here. There is no shortage of government-run clinics in Battambang in addition to a government hospital, however you are likely to wait longer for care here. Care is not free of charge but it is low-cost, and many of the clinics have only nurses and not doctors. There have been reports of corruption at the hospital, so it is wise to be wary. Most of the staff speak Khmer only, so if you do not have strong language skills, private clinics are recommended. Specializing in reproductive and sexual health, Marie Stopes offer a number of services in Battambang. The clinic offers an easily accessible option for reproductive health if you don’t want to to travel to Phnom Penh to see Dr. Anna. Reports are that staff are highly professional and service excellent. Hong Try Optics is recommended by expats who say that they’ve got modern equipment, resonable prices, and English-speaking staff. It’s located north of Psar Nath down a side-street opposite the market stalls. They can do eye tests, make glasses, and sell contact lenses. D-One Dental Clinic on Road 3 is a small clinic that offers a range of private dental care and treatments. Expats have reported that the service is decent and very cheap compared to back home, however some prefer to travel to Phnom Penh for a higher standard of care. Open Monday to Saturday, 7:30 a.m. to 5:30 p.m. There are plenty of small pharmacies around town, however finding staff that speak English can be tricky, so go prepared! Mohaleap Pharmacy, below the Royal Hotel, has some English-speaking staff and stock a large range of medicines. Most can be purchased without a prescription, but of course it is recommended to seek a doctor’s guidance. The Seng Hout Pharmacy, opposite the hotel of the same name on Road 2 near Psar Nath, also stocks a large range of medical equipment including wheelchairs, blood pressure cuffs, thermometers and more. Open daily, 5:30 a.m. to 12 a.m. Despite the plethora of clinics, medical care in Battambang still leaves a lot to be desired. If you get into a serious accident while in Battambang, you may need, at a minimum, to travel to Phnom Penh, and if the case is really serious you’ll need to head to Bangkok. Emergency evacuations can cost upwards of $20,000, so it’s important to have travel insurance when you’re visiting Cambodia, or health insurance if you live here.